In addition to what they view as excessive force and unfair treatment of minorities, including Muslims, the movement is also protesting against home foreclosures, high unemployment and the 2008 bailouts. . . . The group has gained support among some union members. The United Federation of Teachers and the Transport Workers Union Local 100, which has 38,000 members, are among those pledging solidarity. Call the NY Lawyers Guild and give names of people you know being arrested at 212-679-6018 also go to Liberty Park for reinforcements. ‎Protesters speaking out against corporate greed and social inequality took their “solidarity march” to Brooklyn, but battled in a war of words against officers, chanting “We are not criminals” and “Let us go!”. . . . The Occupy Wall Street group was joined by various unions, including the Transit Workers Union and the United Federation of Teachers, in the march to Brooklyn. We are the 99 percent. We are getting kicked out of our homes. We are forced to choose between groceries and rent. We are denied quality medical care. We are suffering from environmental pollution. We are working long hours for little pay and no rights, if we’re working at all. We are getting nothing while the other 1 percent is getting everything. We are the 99 percent. Brought to you by the people who occupy wall street. Why will YOU occupy? RadioHead Hoaxed, but thousands came and marched in support of those beaten, maced, and arrested last Saturday. Transit Workers Union came to speak and announced that their 38,000 workers are in Solidarity with OccupyWallStreet. Thousands marched to One Police Plaza where the police were militantly guarding their building. ‘Online flyers for Friday’s march read: ‘No to Stop-and-Frisk in Black & Latino neighbourhoods’ and ‘No to Spying and Harassment of Muslim Communities. ‘Now, NYPD police scanners are estimating a crowd up to 5,000 are occupying liberty square in a scene that is now starting to look more like Egypt’s Tahrir square. Most important, the occupation movement has to develop a strategy of moving from protest to tapping into the social power that only working class action can provide. The all-out occupation of the Capitol in Wisconsin, after all, was made possible by teachers’ sickouts that shut down most of the state’s schools for several days. That’s why it’s so important that one of New York City’s most important unions, Transport Workers Union Local 100, which represents bus and subway workers, has endorsed Occupy Wall Street. About 2,000 demonstrators have descended on City Hall to protest the nation’s economic climate and to encourage social change and political involvement. A group called “Occupy LA” organized the massive protest. The group is modeled after the “leaderless resistance movement” Occupy Wall Street. 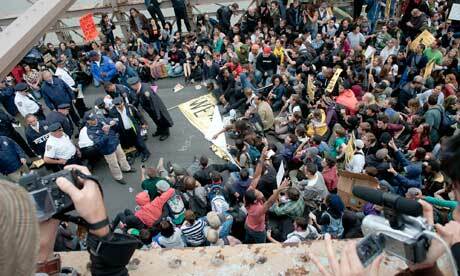 The New York-based group is holding a demonstration there and has shut down the Brooklyn Bridge by mobbing it.